Mayotte is a French island in the Indian Ocean off East Africa between Madagascar and Mozambique. Although France has indubitable administrative control of the territory and it is part of the territory of the EU, Comoros claims the island as one of the Autonomous Islands of Comoros. 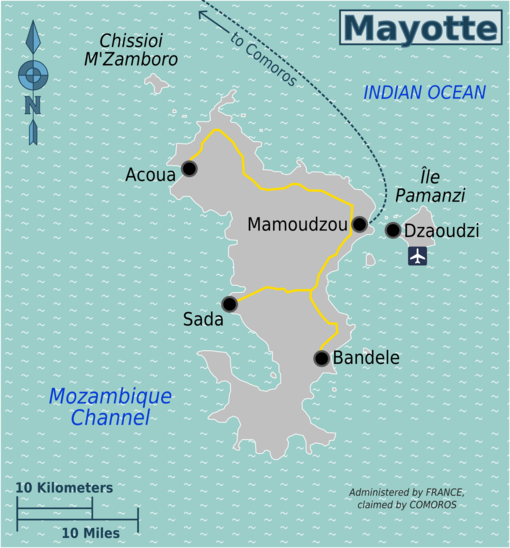 Mayotte was ceded to France along with the other islands of the Comoros group in 1843. When Comoros voted for independence in the 1970s, Mayotte voted to remain a French "collective". In March 2009, the islands voted overwhelmingly (95.2%) to become France's 101st 'departement' effective in 2011. The island is 95% Muslim and many Muslim customs such as polygamy, Islamic-inspired law, and male dominance were commonplace, although all was reversed in accordance with French law in 2011. A large number of the island's population is composed of illegal aliens from neighbouring Comoros. Tropical; marine; hot, humid, rainy season during northeastern monsoon (November to May); dry season is cooler (May to November). Generally forested, with deep ravines and ancient volcanic peaks. Planes fly daily between Réunion and Dzaoudzi, the airport/military base in Mayotte. For a return flight from Paris to Mayotte, expect to cash out at least €800. Kenya Airways announced flights from Nairobi to Mayotte (via Comoros)  in November 2006. This is an extension of their Paris-Nairobi flights. The primary port is Dzaoudzi. The easiest way to get around Mayotte is with bush taxis ("taxi brousse") who will take you around the island for a few euros. French is the official language and is spoken by around 63% of the population. Few people over the age of 65 speak French. The vernacular languages are Shimaore (a language closely related to Comorian and Swahili) and Kibushi (a language related to Malagasay and heavily influenced by Shimaore and Arabic). Kibushi is spoken in the south and north-west of Mayotte, while Shimaore is spoken elsewhere. Other languages spoken by smaller numbers include Kiantalaotsi (closely related to Kibushi), Arabic and Comorian. Currency is the euro (€). Local food and items (bananas, manioc, fish) are inexpensive, imported items (dairy products, manufactured products) are expensive. A hike (almost a climb) to the summit of Mont Choungui will offer a spectacular panorama of the island. Makis (ring-tailed lemur) can be found in remote regions of the island. Diving is mandatory. Expect spectacular sights in the world's largest lagoon. Sea turtles come to roost on the southern beaches. In August-September, humpback whales can be found with their calves in the lagoon. Voluntary service: Volontariat Civil à l'Aide Technique (VCAT). Conditions: you must be French or from another EU-member state or a country belonging to the European Economic Area. You must be over 18 and under 28 years old (inclusive). You must not have had your civic rights revoked by a court or have been convicted of certain offences. Cyclones can occur during rainy season. 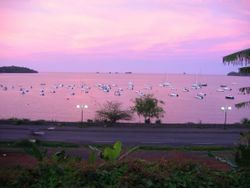 Mayotte is a malaria-infested zone; considered to be high risk. Consult your physician for anti-malaria medicine, take it, and pile on mosquito repellent to avoid bites. 90% of the population is Muslim, following a very tolerant Islam. Greeting others while perambulating about, or a pleasant expression of recognition, a smile, is considered respectful. This page was last edited on 25 February 2019, at 22:10.